My dad and me have played with cars, vans, bikes for years but nothing big and heavy like this.I was hoping to try and find some definitive information about it, and info on how to service and operate it so we don't break anything. The crane itself is 99% operational. Starts, runs, drives, stops and operates as you would expect. 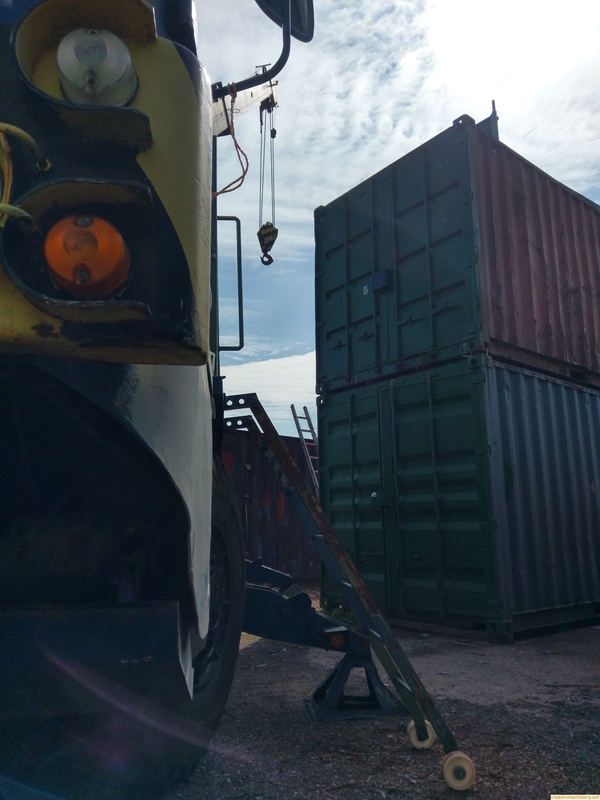 The outriggers lift the unit up and can be levelled, we had a 20ft container swinging in the air the other night and even the mechanical load gauge appeared happy and registered a similar weight to the empty container. It also looks like it could of been ex-mod as the base layer isn't blue but more a green, it has some extra airlines from front and back for recovery maybe. The small issue is the air compressor or governor isn't functioning properly, my brother found it today after chasing the lines around so we will have that in bits this week. We currently make do by using a compressor and generator to move it about at the minute. The biggest problem though is rust on the cab, Its not too far gone but there have been holes for a few years it looks like so the interior is damaged now. I have just quickly knocked the rust back and fibreglassed the holes to water tight it again. I'll pop some pictures up now and grab some more tomorrow. Nice crane there Richard my guess would be that AUX BOX is used to operate the four wheel drive? The army used these so maybe a demobbed one. A few minor hydraulic leaks have shown themselves but she ran for a good 8 hours fault free lifting upto 6 ton, on the other hand I'm knackered chasing the 21ton lifting chains around.